This was a busy month! Not only did we have the ginormous Bead Soup Blog Party, but the incredibly talented Libby Leuchtman was the Cup of Bead Soup featured artist! And this is what I made with part of that Soup. 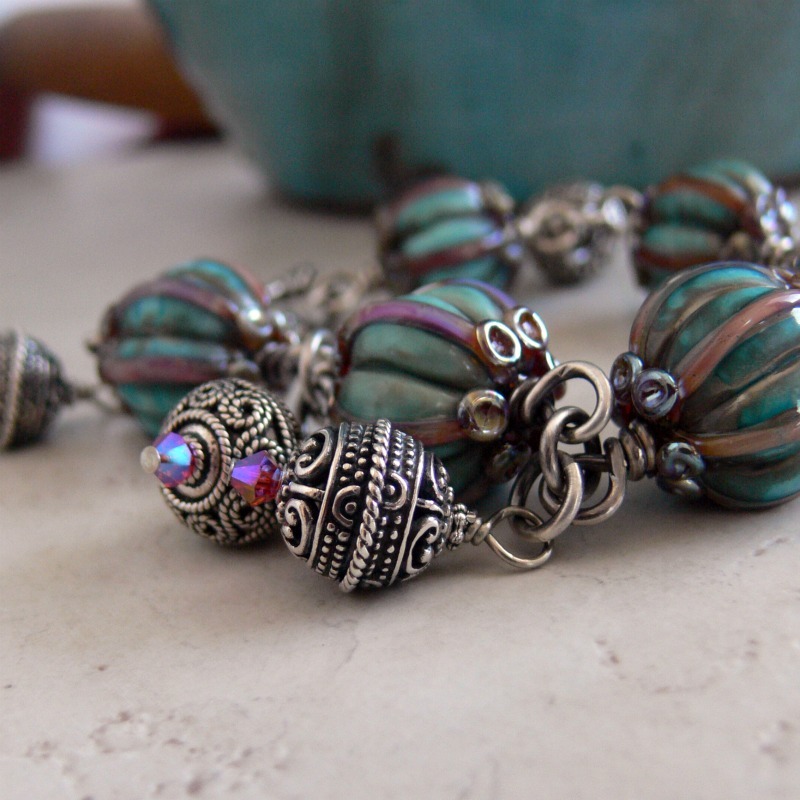 I was left with the amazing little podlets, a silver toggle, and a few Bali beads to mull over, and I have to tell you -- sometimes, less is more, particularly when you're faced with beads that have great color, texture, and creativity to them. I mean, I've never SEEN a podlet bead before, and I just didn't want to muck around and get all fancy on them. SO. 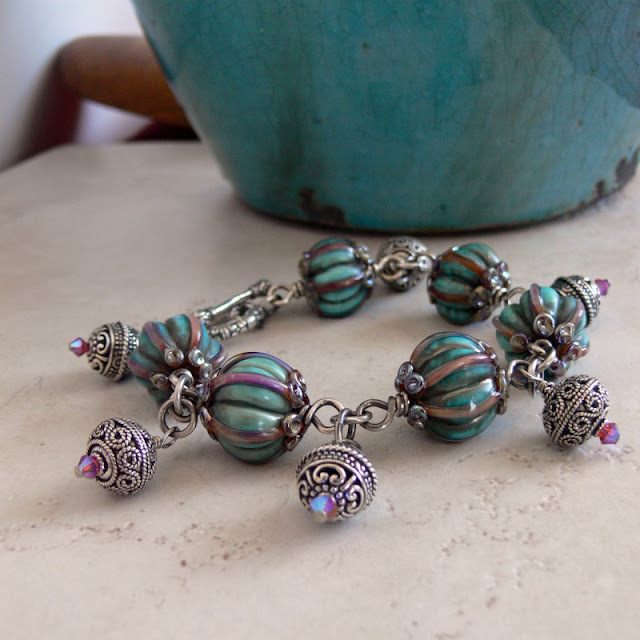 I added three more intricate sterling silver beads to the mix, made charms out of all the Bali beads (accenting them with the PERFECT pink-something AB2X color of Swarovski crystal), and made a simple charm bracelet. Simple, yes, but substantial, and, in-my-not-so-humble-opinion, pretty awesome. The podlet beads are chunky, about 18mm across, so I used 18ga wire for my connections, 16ga jump rings for the charms, and 12mm sterling silver beads. I love the result, even though I didn't really get crazy-creative on it like I did with the necklace. If you would like to re-create this bracelet, visit Libby's shop at the link below -- she has podlets for sale right now, and if she's out, just send her a convo and she'll hook you up! She also has a wide range of lampworking styles, so give her a visit regardless! Thanks for visiting this month's Cup of Bead soup, and tune in for next month's Featured Artisan! Holy moly, that bracelet is to die for! Gorgeous, girl! Those are wonderful pod beads. I love the texture and colors of them! Lovely pieces that you created with them. I am off to take a peek at her store. That bracelet IS to die for!!! :) Love those podlet beads and how wonderfully substantial it is! That bracelet really is fantastic. I ♥ the colors! Wowzer those are gorgeous beads!!!! That bracelet is stunning and of cource you already know I loved the necklace! I thought I had enough soup but that cup went down great! Oh, Lori, that bracelet is so yummy! I'm loving the pod beads - can I lick them?? The necklace is gorgeous! The bracelet is to die for--and I expected matching earrings! LOL See what the Blog Hop Party has done to me??? Both pieces are lovely! Totally eyeing up her pods! She just started making onion domes like those in Russia due to my comment-prod! I can't wait to see where that goes and I will be going there with her! Those pods are just amazing! I love the combination of colors and those sweet little crystals add just the right amount of bling. That bracelet is sooo stunning!!! TOTALLY awesome!!! ANd your photos are just gorgeous as well. You are a very talented lady!! That's a real treasure, for sure. Holey Catfish, the bracelet is a show stopper! Love love love it! 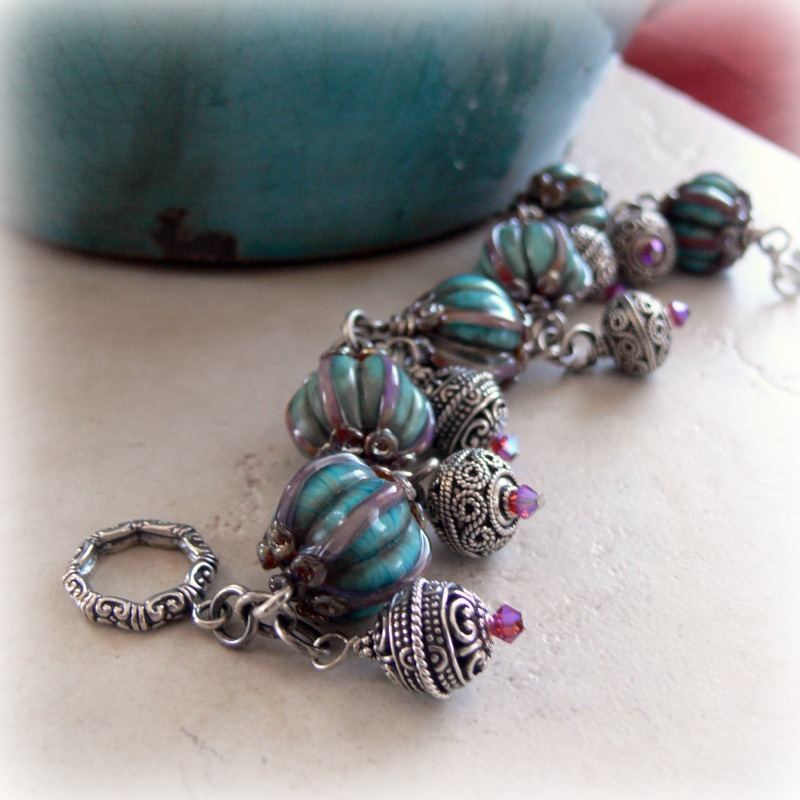 I am taking a lampwork bead making class this weekend! I can wait! It turned out perfect. Couldn't ask for a better design! That bracelet turned out so pretty. I love those little podlet beads. Will have to check out her site. I'm still working on the Bead Soup blogs right now. OMG...I LOVE those beads! Just scrumptious! If you weren't already in my RSS feed I would have added you when I saw this bracelet just to make sure I didn't miss anything else you might create. Those beads are simply beautiful- great color and great shape. Love it Lori! I love the whole less is more for the little podlets. As always, Lori, very nice! I'm still blog hopping. I hope to finish by the end of the week! Thanks for organizing this! I totally love how you used the pods in a charm bracelet, it is gorgeous, the crystal mirror the color of the pods very well! just Beautiful! Lori these beads are beautiful in and of themselves. However what you have done with them is stunning. Your design on the necklace is perfection. Your work is extraordinary. I am yearning after those podlettes.Love the color combination.By the way, HOW do you find the time!! Those podlet beads are so special and yummy! 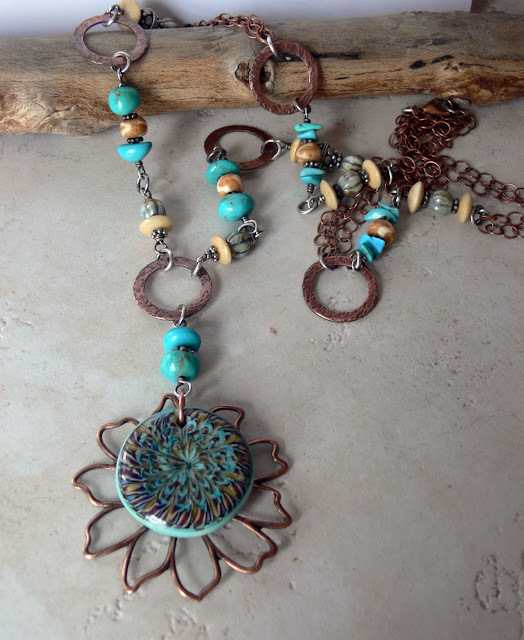 Love how you combined them with dangles - great combination! The bracelet is such a lovely one! The podlets are superb; I'm happily waiting for a pair of my own :-D Thank you for giving the link to Libby's. That bracelet is just stunning. I am going to make that black bean soup tonight. Just a few vegetarian tweeks. It looks divine. Beautiful pieces! I always love your work! If bead soup gets any bigger, it may have to become an Olympic sport! What a blast! This is really very Lovely! How did I miss your post!? Beautiful necklace Lori! It has taken me ages to get here, however, worth the wait. I love what you made with your soup, and especially how you seperated it. The large center bead ending up being a star on its own, as did the podlets in the bracelet. You were right together might have been overwhelming. Really like what you made. You are an examplet to us all, and Cindy was right, please put on your crown and take a bow. WIN a Pint of Bead Soup! Why Do You Follow a Blog? And Now for Station Identification. Cup of Bead Soup -- The Beads are Here! Wire Style 2 Giveaway Alert!